There is no mention of Edingley in Domesday Book in 1086 although locally there is reference to churches at Blidworth, Farnsfield, Osmanthorpe, Kirklington, Salterford, Oxton, Southwell and Normanton. The village may possibly have been one of the 'outliers' described as in the hands of the Archbishop of York under the Domesday entry for Southwell. One of the earliest mentions of the church is in the last two decades of the 13th century when one Master Clarell, who held a considerable number of benefices, apparently held the living at Edingley which was in the Peculiar of Southwell. At the 1291 taxation of Pope Nicholas IV the 'Prebenda de Eddyngley que pertinet ad dictam communiam' which was a spirituality of Southwell Minster, was valued at £8 per annum. In the Nonae Rolls of 1341 the church, which pertained to the canons of Southwell, was valued at 12 marks (£8), and the ninths of sheaves, fleeces and lambs were taxed at the true value of 8 marks (£5 6s 8d) a year and no more, and that the arable land and meadow were worth 12s 4d, and the tithe of hay was worth 20s; there is no mention of altar dues. In the 1428 subsidy of Henry VI Edingley is again listed as prebend of Southwell and was taxed at 16s, i.e. 10% of £8 showing that the clear annual value had not changed since 1291. In 1301 a Henry de Edyngley occurs as a perpetual vicar of Norwell and who was a respondent in an appeal that year. On 18 July 1310 Archbishop Greenfield was at Edingley church where he wrote to the bailiff of Southwell requesting delivery of two oaks from nearby 'Edelawe' to Master William de Weston, which he had freely given. The archbishop was there again on 10 August 1313 to issue instructions regarding Trowell church, and a more serious case of a clerk, Robert de Killum, who was accused of homicide. In December 1313, he required the Chapter of Southwell to appear by their proctor to show why they had appropriated several parish churches, including Edingley against the common law ('conta ius commune'). 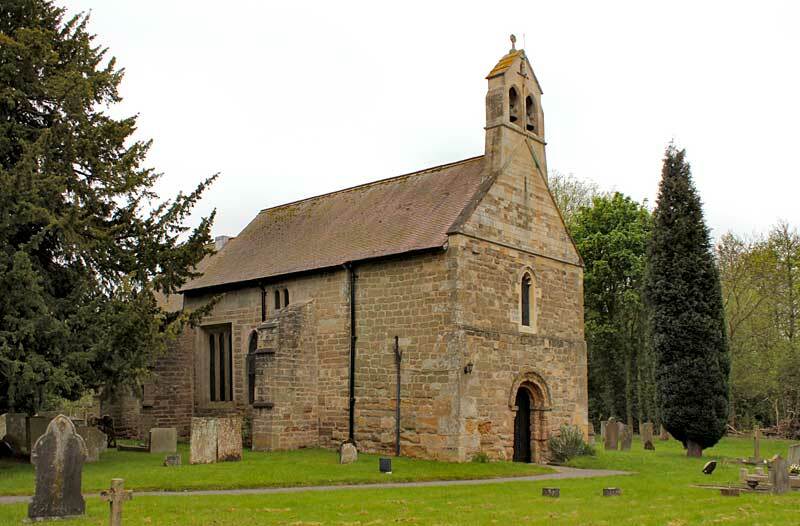 Despite Edingley forming part of the Peculiar of Southwell, and being so close to the town, it is not mentioned at all in the Capitula of Archbishop William Melton (1317-1340), presumably as it was very small and insignificant at this time, and raised no special issues. In 1396 an entry appears in the Papal registers under Pope Boniface IX who wrote to the Prior of Worksop with a mandate to reserve to John Thorp, perpetual vicar of 'Dryngley' [assumed to be Edingley] a benefice of value 60 marks, with cure of souls, or 18 marks without, in the common or several gift of the abbot and convent of St Mary's without the walls at York. From the Parish Registers, typed out by James Paine in 1941, up to 1527 it is recorded that Edingley was a 'chapelry' attached to the church at Southwell (as also at Halam, Farnsfield, Halloughton, and Bleasby). The Chapter appointed a chaplain, (probably a vicar choral), as curate. In 1527 the Chapter House constituted the chapel a vicarage by order of John Maxe canon of Halloughton in Southwell, abbot of Welbeck and bishop of Elphin, suffragan to the archbishop of York. At the Reformation, in 1534, various lands and holdings in Edingley belonging to Southwell Minster (mainly of the Vicars Choral), are listed, such as the properties of Francis Hall, Cantor, who held a house with appurtenances in Edingley worth 8s. The details of penance directed to be undergone by a woman in 1528 included walking round Edingley churchyard, on Palm Sunday, with bare feet, and a net spread on her head; on Good Friday to approach the cross with bended knees. Archbishop Herring's Visitation Returns of 1743 recorded that 'Eddingley' was one of a number of parishes that had made no Return to the Archbishop. A watercolour and ink sketch by Samuel Hieronymus Grimm of 1773 shows a view from the north of the church in open land with a north porch, flat roof with parapet and wooden top to a west tower. The window arrangement is much like today, but buttresses now evident were not needed at the time. The church has undergone many changes over the years that have included the removal in the late 1790s of a south aisle. The church was repaired in 1796 by tythsman Gib't Brown and John Harvey. The chancel was 'rebuilt' in 1844 by Henry Machin (Machon) of Gateford Hill, near Worksop and the rest 'clumsily repaired', when the church was 'thoroughly repaired at the expense of the parish'. Henry Machin was also a freeholder of part of the freehold of Edingley. In 1848 the living was a perpetual curacy, valued at £4 in the king's books, with a net income of £60 and impropriator, C. Machin Esq. By the mid-1800s the wooden top of the tower had been replaced by a brick construction and this was replaced under a faculty of 1897 with the stone bell cote extant to-day. In 1897 the last major restoration works, estimated at £1,000, were carried out under the directions of Charles Hodgson Fowler, a Rolleston-born architect who was cathedral architect at Durham as well as working on the restoration of at least 17 local churches from the 1870s until the early 1900s, and designing several new local churches. £473 was in hand, £160 promised and the remainder would be raised by subscription. Work included removing the lead flat roof and replacing it with a tiled double-pitched roof, lowering the walls to their original height, and replacing the modern brick tower with a stone bell gable with 2 bells, raising the east window without changing the tracery, reseating the nave of stained deal, removing the west gallery, re-fixing the font on a new step, re-plastering the walls, laying a new wood and stone floor, underpinning the buttresses and repairing the stonework, laying new drains and providing a pit and a heating stove with a new flue carried up into a new chimney. The faculty application also included opening up the arches in the south wall and adding a new south aisle with a vestry to the east with a 7lb lead roof. The old lead from the nave and chancel to be used or sold to provide new. The drawings for the works were done in 1891 but it is not known why this work was never carried out. An application for grant help was made to the Incorporated Church Building Society (ICBS) in 1892 but this was turned down. Copies of the existing and proposed drawings are held at Nottinghamshire Archives. A faculty application of 1909 is recorded for a lych gate erected at the entrance to Edingley church. In 1961 wooden screens were added at the west end to form an open lobby with two small open side rooms with sliding doors, one used as a vestry and the other a store after a ceiling was added over the lobby area. The current pair of doors and frame in the west doorway were constructed by George Brooks of Mansfield, a master carpenter, who was commissioned by the church architect to replace the single door in about 1960. It was a skilled job and entailed all of his expertise which the architect acknowledged to him and commended his work. George was very proud of the church as he was married there in 1938 to a local girl Dora Fogg, daughter of the village shopkeeper, Mrs Edith Fogg. In the mid 1960s stained glass to a design by Francis Skeat was installed in the main chancel window. The faculty application 'for the adornment for the House of God' was entered by the Ven. T. Dilworth-Harrison who was semi-retired and priest-in-charge living at the vicarage in Halam. There was some concern about the design and colours of the glass. The overhead electric heating system was replaced and extended in 2016; heating is provided in the nave and over the choir stalls and the heaters are more efficient than their predecessors. WC facilities were also procured in the Old Schoolroom. No church mentioned in Domesday Book, prepared under the direction of King William l.
Date of the treble bell. ij belles in the steeple, one handbell. W M - I B - C W - ENO 1639 (from exterior stone inscription). Churchwardens? T C, A B and T F (from exterior stone). Churchwardens. The chancel was 'tyled and paved'. The church was 'whitewashed (3s) and painted (£3) by Blantern of Southwell'. School endowed by John Lamb and Samuel Wright, with a house and 5.5 acres of land. Curate Samuel Abson admitted by the Chapter of Southwell, 20th Jan 1742. Joseph Hinch and Peter Godfrey, churchwardens. Enclosed, when allotments were made in lieu of tithes. 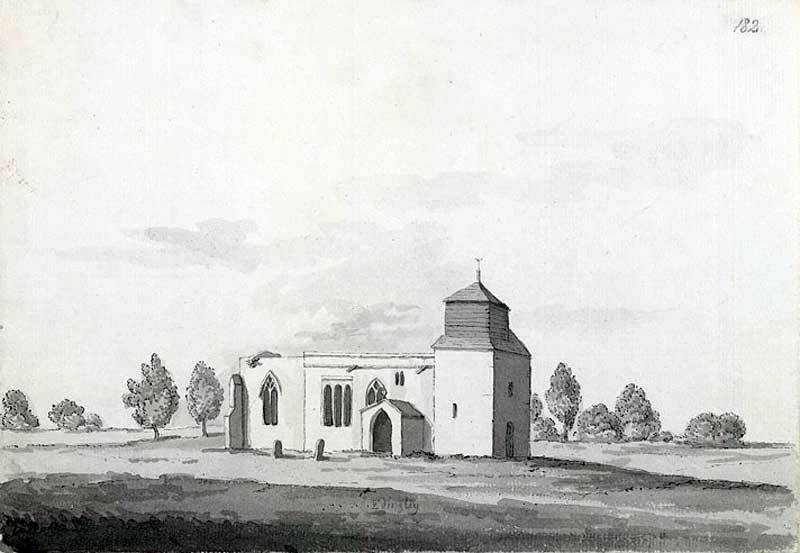 Sketch of church by Hieronymous Grimm. Jno Fairbrother and Thos Bausor, churchwardens. Church repaired, including pews, by Gilb't Brown and John Harvey. Date of tenor bell by J & E Smith of Chesterfield. Chancel 'rebuilt' and the rest repaired. Recorded that a brick tower had been added by this date. Railway came to edge of Edingley. Insurance policy – ref. church and furniture for loss by fire 3rd Aug 1893. Robt. F. Smith, M.A., vicar. Henry Beckett and Edward Cope, churchwardens. Vicar was the Rev. Robert Frederick Smith. Date of Dedication on brass baptismal water jug. Late Vicar of Edingley the Revd. Rd. Bethell Earle. John Basilico and Francis Whitehead, churchwardens. Faculty – Lych Gate erected. Faculty stained glass window in west end, dedicated to Copeland Family. Faculty for Memorial Tablet to John Toder. Ven. T. Dilworth-Harrison, Priest in charge. John Robert Marson and Frederic Charles Parr, churchwardens. Faculty 18th June church bell 6.6.0. Faculty 11th September, stained glass window by Francis Skeat, window dated 1965. Ceiling added over lobby, altar rail extended, lych gates rehung by C G Rhodes, builder. Internal redecorations and new electric main board, electric overhead heaters added. Floorboarding repairs over pit area. Stonework repairs to west door reveals. Parapet walls at ditch rebuilt in stone. Replaced damaged flagpole on west boundary.